CyberLink PowerDirector 17 Ultra is a consumer-level editing system with a comprehensive feature set, including many pro-level features. PowerDirector allows you to cut and trim your videos, apply effects and music, add titles and transitions, and fix and color-correct footage. There are also special features such as screen recording for creative web demos and tutorials. The workflow is designed to operate quicker and easier with one-click presets, a drag-and-drop, and an intuitive interface. The application is Windows-compatible and supports up to 4K resolution videos and many popular formats. 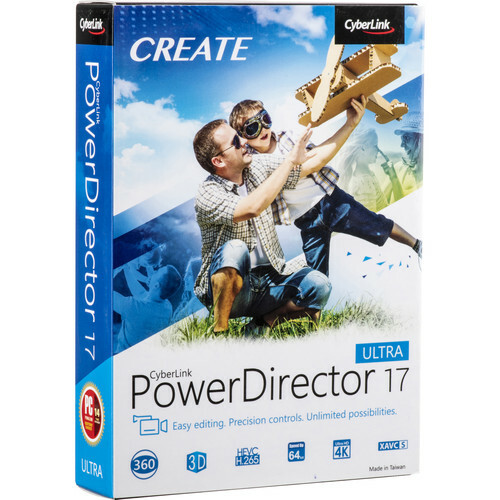 The Ultra version has the full feature set of PowerDirector 17 and also comes with CyberLink Content Packs Premium 1, 2, 3, and 4, 50 background music tracks, and 100 sound clips, as well as ProDAD Adorage 13 Lite and NewBlue Essentials 1 3rd-party plug-ins. All these allow you to highly enhance your projects. Additionally, the Ultra version includes 25GB of CyberLink Cloud Service for one year. For times when you want a completed project very quickly, PowerDirector 17 features its Express Projects section, which offers a wide range of templates that you simply need to drop your clips into. The templates are complete with effects, transitions, animations, and music. These projects can then be shared directly to social media from PowerDirector at the press of a few buttons. For action camera enthusiasts, PowerDirector 17 has an Action Camera Center that provides everything you need to edit, correct, and enhance your action cam footage. For 360 spherical VR enthusiasts, PowerDirector 17 supports importing equirectangular footage, editing it with a full range of tools—including 360 video stabilization—and then exporting in 360 format. Among the advanced features, you'll find motion tracking, multicam editing, audio ducking, look-up table support, split toning and HDR effect, chroma key, and much more. Access projects anywhere with 25GB of cloud storage included for 1 year. Sync multiple clips using MultiCam Designer, then finish editing and producing in Video Collage Designer. More border color and size controls. Also, make interclip border adjustments and save/download customized templates. Improved stabilization engine, plus the ability to adjust temporal and spatial ranges and axis rotation. Import WebM (VP9 video and Opus audio), import HEIC, export JPG and PNG image sequences, produce MKV with DTS/AAC audio. Import and export SRTs with customized fonts, colors, and styles. Audio Editor integrated directly into the PowerDirector editing workflow allows for seamless audio editing, plus vcal transformer and echo effects. Improved architecture enables more hardware decoding instances and Intel 8th Generation Core i CPU optimizations with TrueVelocity 8. Box Dimensions (LxWxH) 7.6 x 5.3 x 1.6"